Heat oven to 350°F. 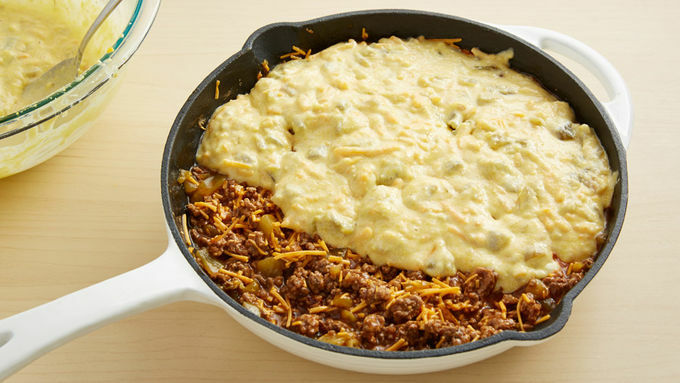 In 10-inch ovenproof skillet, cook beef over medium-high heat 5 to 7 minutes, stirring occasionally, until beef is thoroughly cooked; drain. Stir in enchilada sauce, 1 can of the green chiles and the chili powder. Remove from heat. 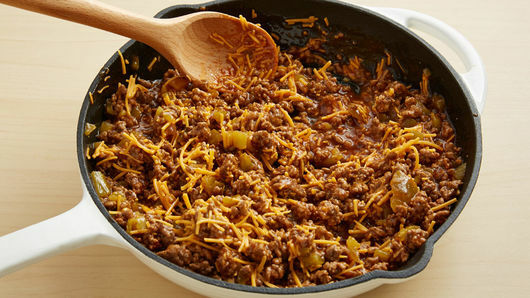 Sprinkle with 1 cup of the Cheddar cheese. Meanwhile, make corn muffin batter as directed on box. Stir in remaining 1 can green chiles and remaining 1/2 cup cheese. Spoon batter evenly over beef mixture. Bake 35 to 40 minutes or until topping is golden brown. Cool 5 minutes. Make it fresh! Top with diced tomatoes, sliced green onions, fresh cilantro leaves, sour cream and pico de gallo or salsa, if desired. Add a fresh green salad to round out your meal. Did you know that tamales have been around since 7,000 BC? The word tamale comes, via the Spanish word tamal, from Nahuatl, the main language spoken at the height of the Aztec empire in central Mexico. Other names this traditional dish include “zacahuil” (Veracruz), “pibs” (the Yucatan), “hallaquitas” (Venezuela) and “humitas” (used from Ecuador south to Argentina and Chile). Whatever you may call it, the recipe is largely the same: a body of corn dough, wrapped in a corn husk or banana leaf and steamed until cooked. Making tamales in the traditional way can be very labor-intensive. For instance, one Oaxacan-style recipe contains more than 120 discrete steps—that’s a lot of time! 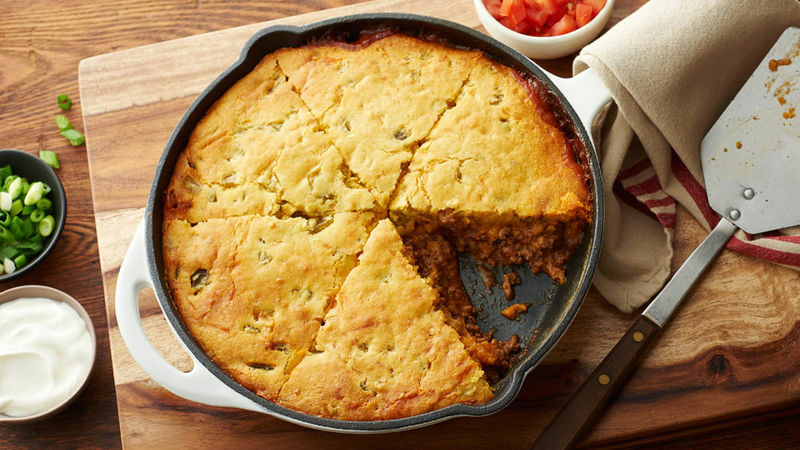 Luckily, this tamale pie WAY easier. It has just seven ingredients and comes together in under an hour. Now that you see pie is more than just a dessert, you can check out all of our pie recipes for every meal, from meaty pot pies to fruit-filled sweets.